What do Cook, Nelson and bunnies have in common? 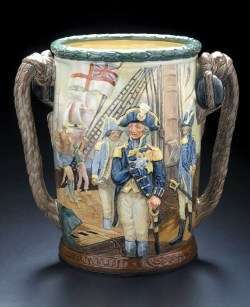 In the Navy gallery of the Australian National Maritime Museum there are three double handed cups commemorating particular moments of Australian and British naval history. James Cook, Horatio Nelson and Arthur Phillip are immortalised in the moments that endeared them to the public forever. As much as these cups recognise the achievements of those famous men, the cups are also representative of the career of a much less well known man, Charles Noke of Royal Doulton. Noke was one of those men who was born to his profession. Who knew from a very early age what he wanted to do with his life and had the natural talent to achieve it. He became an apprentice ceramic modeller in 1874 at the age of 16 to the Royal Worcester Porcelain factory. In 1889 Noke then moved to Royal Doulton as the chief designer and modeller at their famous Burslem factory in Staffordshire. 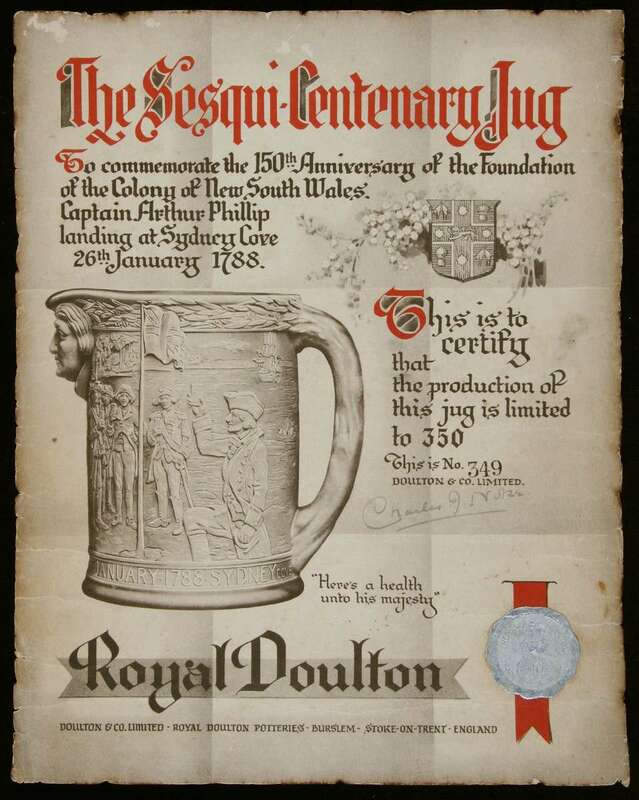 Noke and his colleagues, were working at Royal Dolton during a great period of great creativity where the traditional and functional role of Royal Doulton was expanding into artistic and decorative ware at its Burslem site. 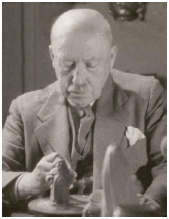 Noke became Artistic Director in 1914 and was eager to continue to grow the Royal Doulton figure range which he had been working on since 1893. The figures had not been commercially successful and in addition to the war, Noke’s attention had been diverted elsewhere. But now he was focused on what he believed would be a strong part of the future of Royal Doulton. It was in the early 1930’s that Noke introduced the range of Loving Cups and character jugs of the type seen in the ANMM collection. Noke was a great lover of English literature, especially Dickens, and English history. These first issues of Loving Cups were based on popular historical figures, such as Nelson and Cook, historical events and characters from widely known fiction. The wide appeal lay in the characters recognizable faces and events. 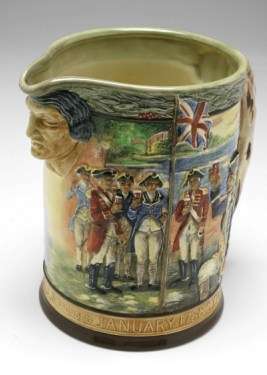 The Captain Cook Loving Cup. ANMM Collection 00040524. Noke had invented what would become known as “Series Ware”. It was a burst of business genius and would become a significant part of the Royal Doulton range, even today. In 1939 Noke and Cuthbert Bailey, a long-time collaborator and the manager of the Burslem factory, came together on a new project. Bailey had introduced the Bunnykins range of nursery ware in 1934. It was Bailey’s daughter, Sister Mary Barbara who had created the Bunnykins characters whilst living in a convent of the Augustinian Canonesses of the Lateran. 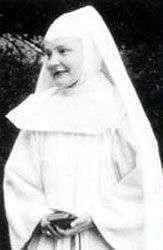 It is said that the Reverend Mother of the convent was against the venture, but allowed it to go ahead if it was kept under wraps and if Sister Mary Barbara received no financial benefit from her work. Recognizing the appeal of Sister Mary’s Bunnykins characters, Noke created a series of six bunny figurines based on her drawings. 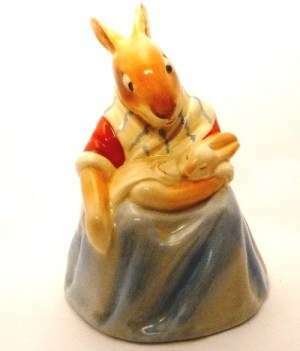 These were the first ever Bunnykins figures, a series that is now synonymous with many childhoods and with Royal Doulton and still it’s most popular series today featuring hundreds of different characters. Whether bunnies, heroic men or the rogues of Dickens’ imagination, there is great sentiment in Noke’s interpretation and modelling. 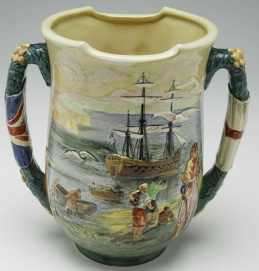 In the cup of the Captain Phillip and the First Fleet, we see the landing party having a drink while cheering the British flag. Nelson is portrayed proudly on his ship before battle yet vulnerable with his pinned sleeve and concerned expression. And Noke’s first bunny figures are as endearing as the tender Bunnykins drawings by Sister Mary Barbara. Noke ‘retired’ from Royal Doulton in 1938 but apparently modelled every day until he died in 1941. His son Cecil took over his job and continued the work that his father had started. Charles Noke’s vision of thematic figures, plates and cups became a legacy that lives on in living rooms today. But his idea was more than just a publicity or commercial promotion for Royal Doulton. Whether through the Bunnykins figures or national heroes Loving Cups, Noke ensured that there was something for everyone in his world of ceramics.